CyberGRID began as an independent study for professor John E. Taylor of Columbia University’s civil engineering department. At the time that I approached professor Taylor he conducted a yearly class that involved doing collaborative design projects with 4 other universities around the world. This collaboration was facilitated via online classrooms in Second Life, a well-known web-based 3D environment for social, commercial, and academic meetups. 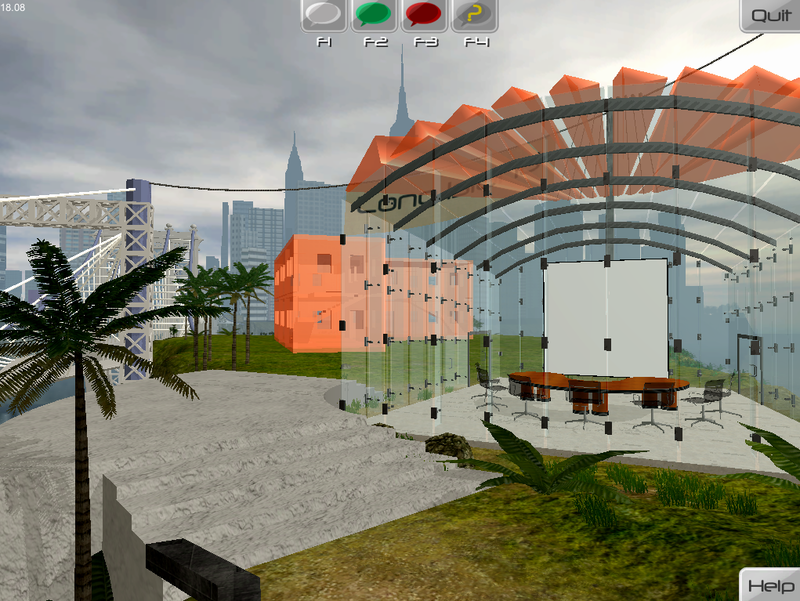 With Second Life, Taylor’s class virtually met and worked with other students and professors from the Indian Institute of Technology Madras, the Helsinki University of Technology (HUT), the University of Twente in the Netherlands, and the University of Washington (Seattle). 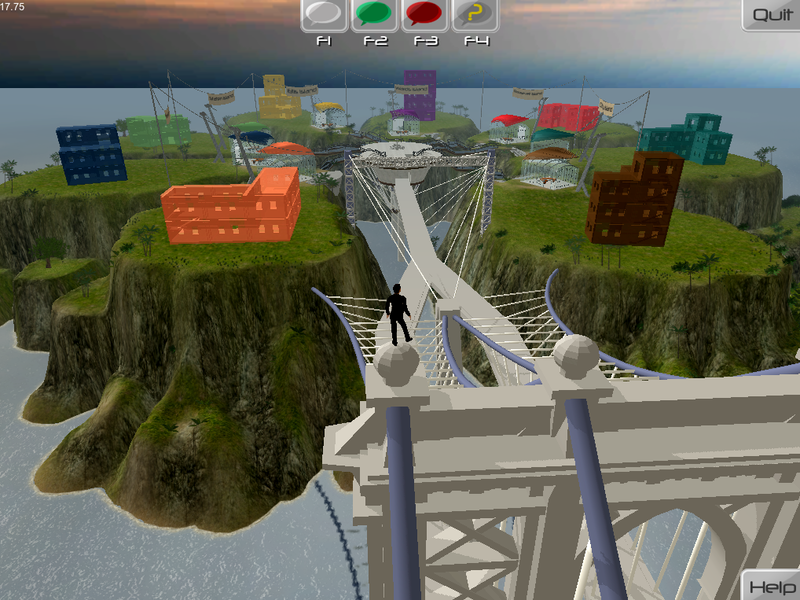 Professor Taylor initially asked a good friend of mine, Daniel Lasry, and myself to make alterations to the virtual islands that he was already leasing within the Second Life environment, as well as, attempt to write plug-ins for the Second Life interface to provide his students with customized interactivity. 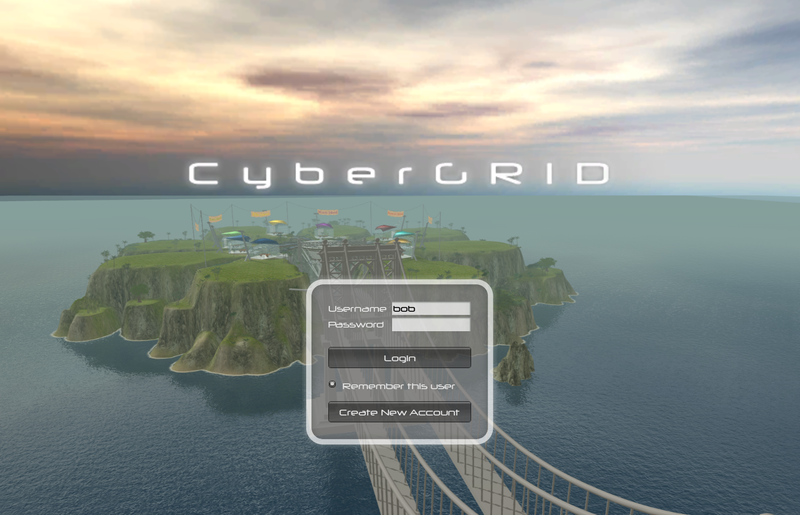 After researching the capabilities of Second Life development, Daniel and I decided that CyberGRID’s customizability was limited by licensing restrictions that Second Life had in place. We convinced professor Taylor to allow us to start from scratch and develop a comprehensive and fully customized virtual learning environment using the Unity game development platform, and Maya and Photoshop for asset creation. The first phase of the project was in the form of an independent study where we familiarized ourselves with the Unity software and began developing a new aesthetic, a new interface, and new functionality based on feedback from users of the previous version of CyberGRID. During this phase of the project, the other designers and myself were familiarizing ourselves with the Unity development environment. I had to learn how to optimize 3D models for game design, ensuring that the assets were all polygons and making sure that the faces were all pointed the correct direction. Below is a scrapped concept render of part of the CyberGRID environment that I created during this early phase of the project. After our team excelled during our independent study we were hired to continue working on the development of CyberGRID over the summer of 2010. During this time is when the project really took off. 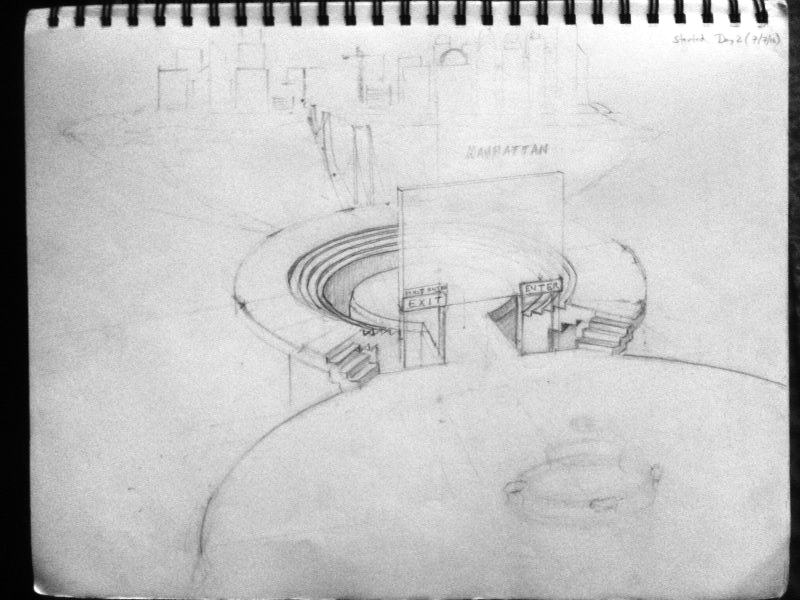 I was responsible for designing and creating an extensive virtual environment, creating/locating a collection of 3D virtual avatars (see my 3D Character Design post for a more thorough description of this process) for the future users of the application, and animating and texturing the characters and environment, and designing some of the UI. 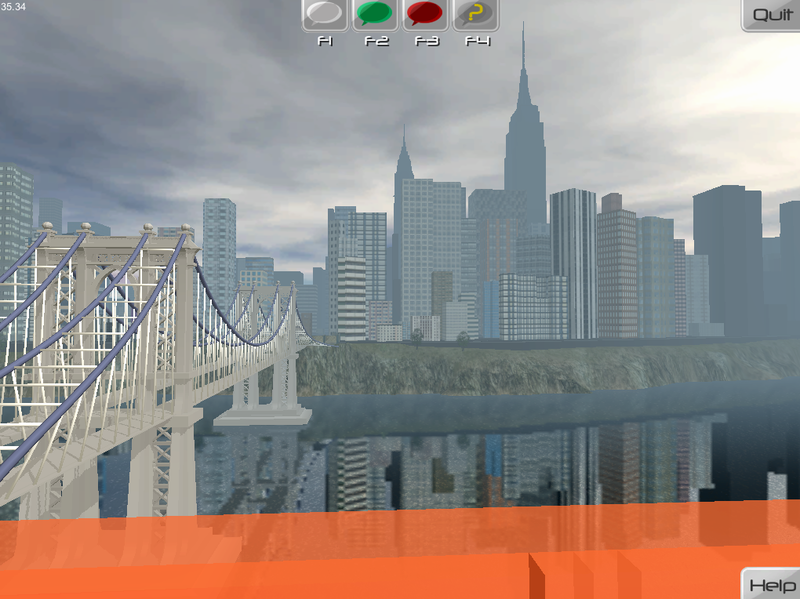 Below is a render of Manhattan (model from Google’s 3D Warehouse w/ my textures) and the Manhattan Bridge, which I modeled from scratch. 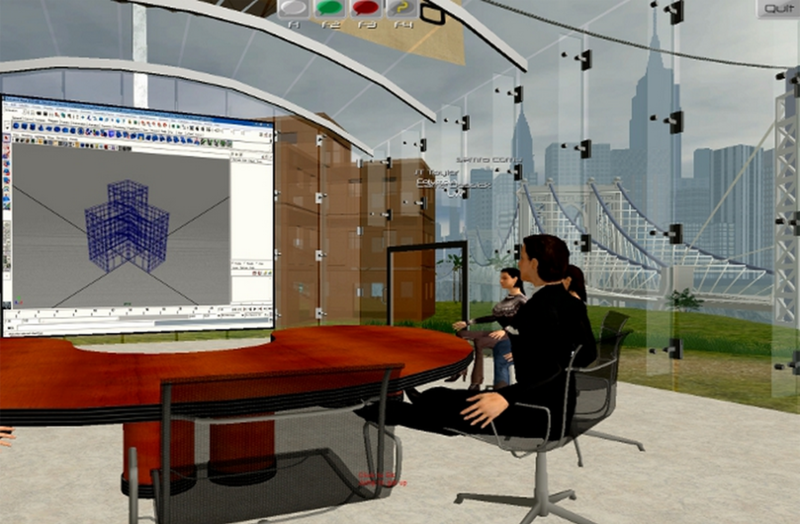 Here is a screenshot of users interacting with a virtual monitor that is sharing a real-time render of one user who is working in Autodesk Maya – just one of the many powerful system features. Currently, the development and use of CyberGRID is being pushed forward by professor John E. Taylor of Virginia Tech’s Engineering Department as he continues his research in virtual learning environments and the psychology of the relationship between human and computer interface. For this project, I worked with 5 of my classmates in Columbia’s Civil Engineering department to develop the excavation plan and foundation design for the new Bowtie Building being built at 125th and Broadway in Columbia University’s Manhattanvile expansion. Our civil class was separated into 5 groups which worked on separate aspects of the building. The other groups were Concrete Design, Steel Design, Project Management, and Green Building Design. 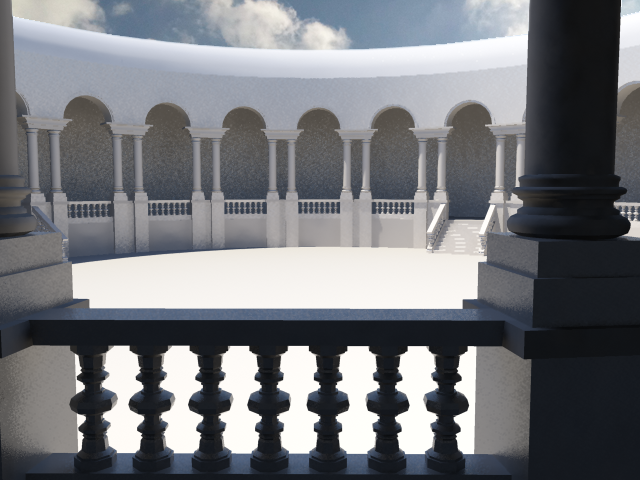 For my group, I contributed to the structural design of the foundation in addition to modeling and rendering a sequence of images that visual detail the process. Note: this is not actually the building that is being built at the site; our senior class proposed this as our final senior project to our professors. This 3D rendering (Maya, Photoshop) was an assignment that I completed for an art class at Columbia. It is a commentary on the rapidly evolving technologies of the book industry as well as a tribute to the book 1984, one of my favorite childhood reads. I designed this top down computer game, Zombie King with a few of my friends while at Columbia. I worked as the teams primary concept artist and asset designer. 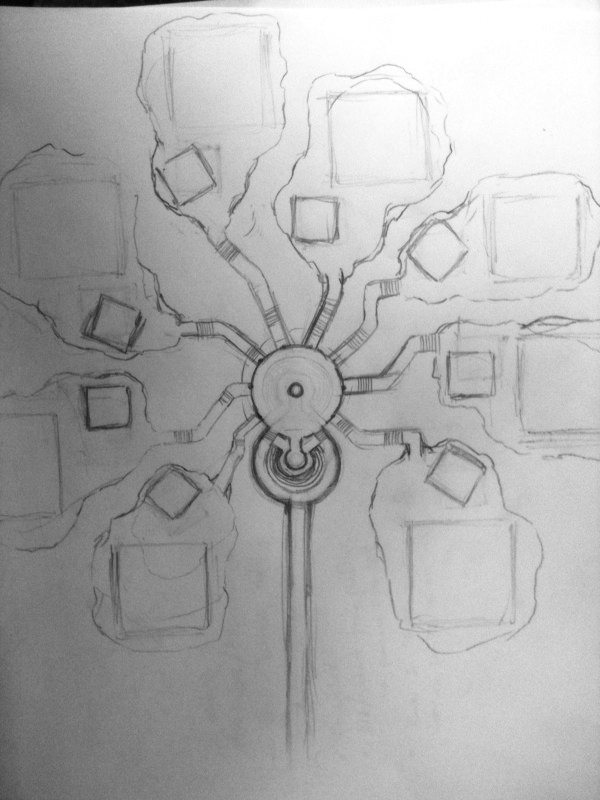 We used Flixel for our game engine, and I used a pencil, paper, and Photoshop for the asset design. 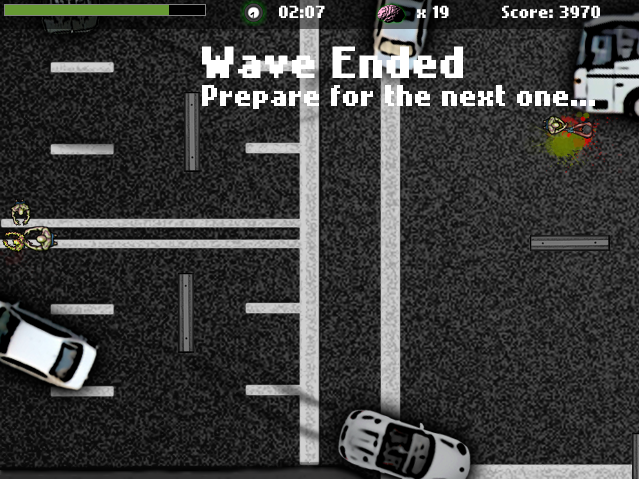 The mechanics behind the game are derived from a narrative where you are a zombie and you must lead a horde of fellow zombies in a war against the humans. This model was initially designed to be part of a custom character database for my CyberGRID project. Developing an entire custom character database of this level of detail posed to be a very time-consuming endeavor. Thus, the project turned out to be a terrific learning experience on 3D character modeling and texturing, but we ended up purchasing (from turbosquid.com) a line of much less attractive models that were pre-rigged. 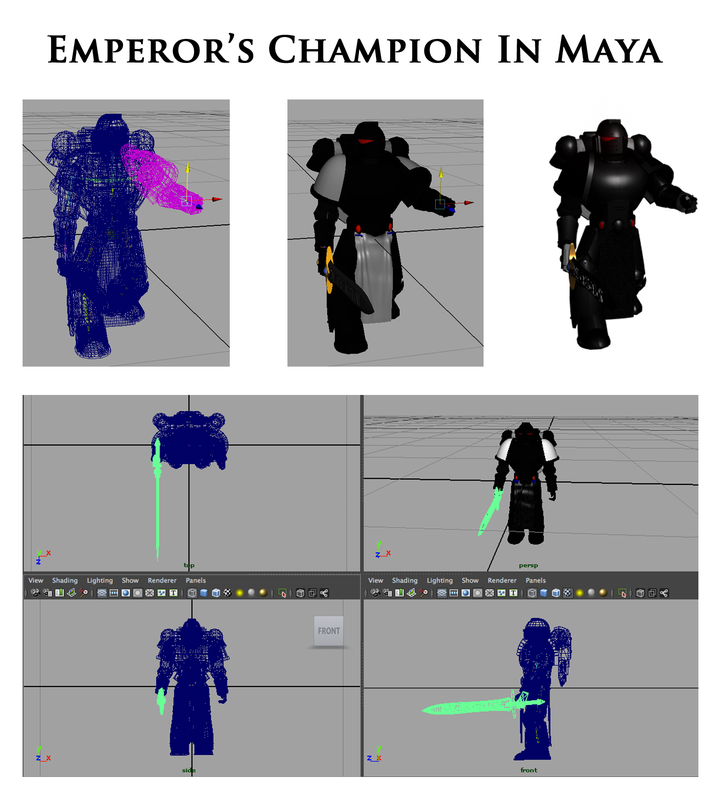 Note that this post is somewhat of a walk-through tutorial, but it assumes that the reader has at least a basic understanding of the Autodesk Maya software. 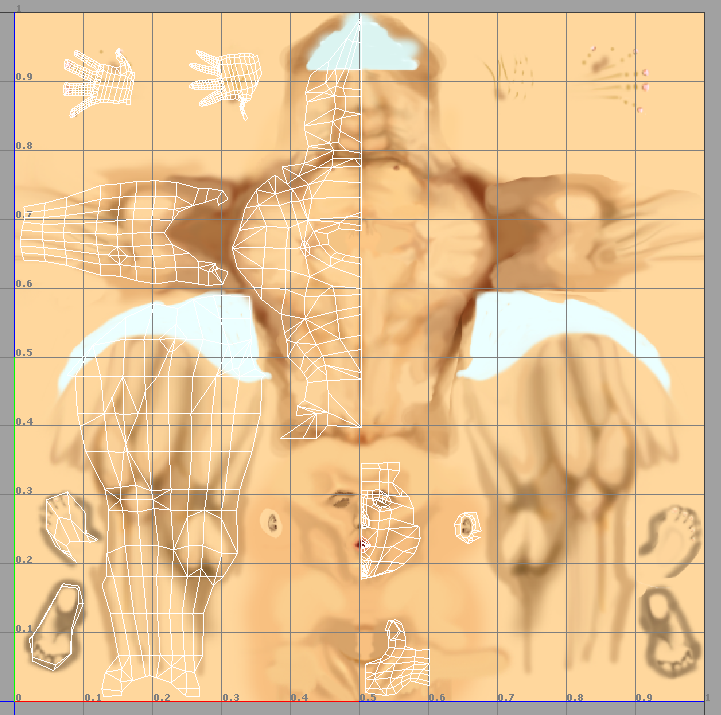 Step 1) I started by drawing a front-view symmetrical sketch of the male anatomy, as well as, a profile sketch that matched the scale of the front view drawing (below). The rear-view drawing was used as a reference once I need to texture the model. Step 2) In Maya, I created simple cylindrical polygons with 8 axis subdivisions (varying numbers of spans depending on the part of the body) and scaled the vertices of the polygons to match the various major limbs (arm and leg) of one half of the body. 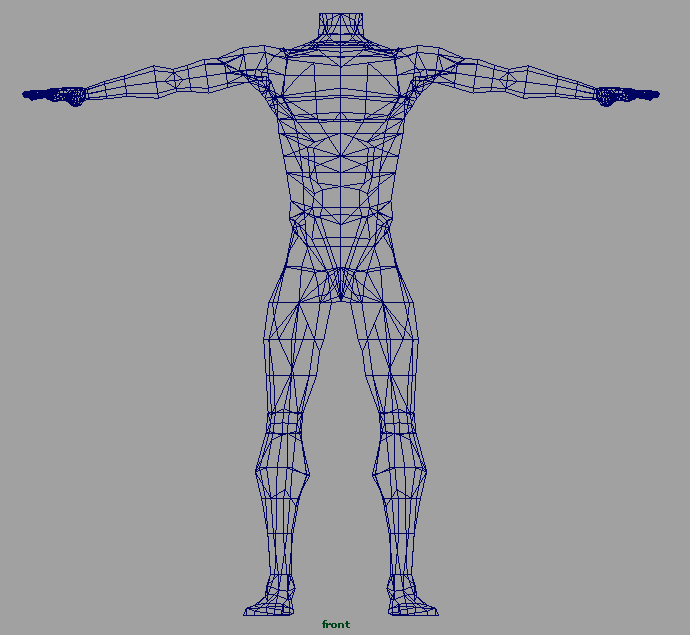 I only modeled half of the body so that I would be able to mirror what I had done to create a symmetrical mesh. I used the front and side sketches above as Image Planes in the front and side windows respectively. For the torso I used half of a cylinder (deleted the faces of the other half). 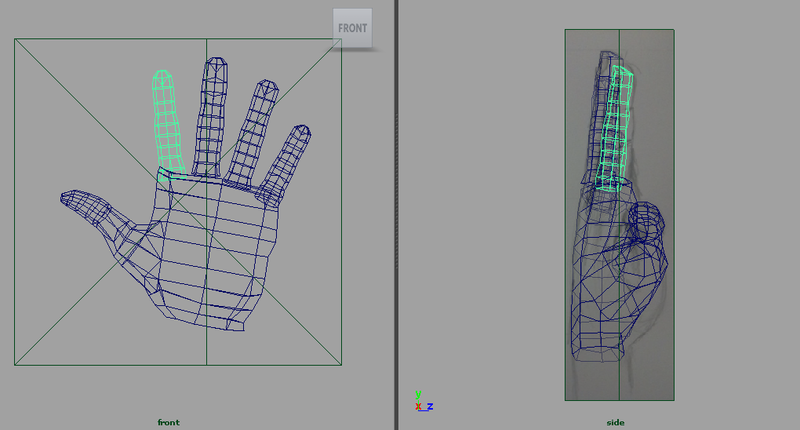 Once the arm, leg and half-torso were finished I sewed them together, combining the meshes using the Merge Vertex Tool. Step 3) I then used the same technique to model the fingers, thumb, and palm of the hand on the side of the body that I had already modeled. After it was finished I combined the hand mesh with the rest of the body and then used the Merge Vertex Tool to close the gaps between the meshes. 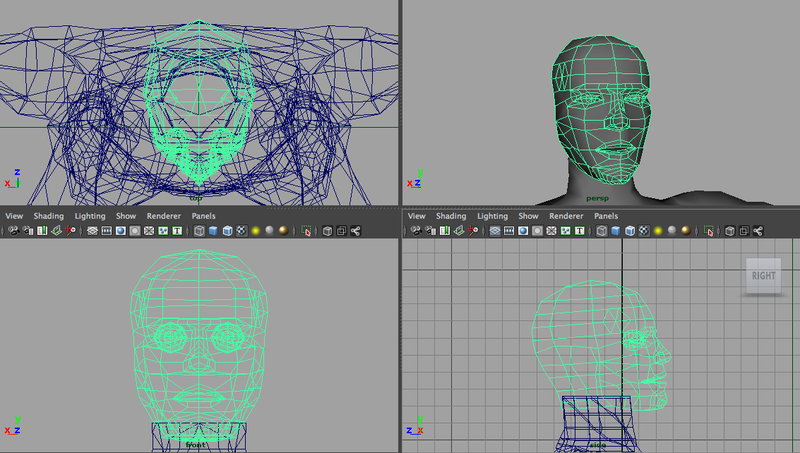 Step 5) I then used a similar process to create the head of the model. This process was more complex than the body parts due to the topographical abnormalities of a human head (nose, mouth, eyes, ears). It required more frequent use of the Split Polygon and Insert Edge Loop tools. Step 6) Once the model was complete, I used the Cut UVs tool to separate the UV map of the model into flat sections that would be easier to illustrate in Photoshop. To do this I tried to make all of the UV “seams” in less visible areas (i.e. 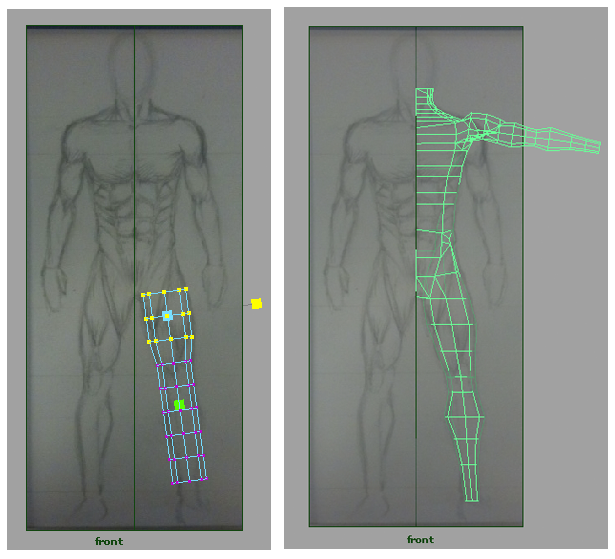 under the arms, sides of torso, inside of legs). A good technique is to make the seems along heavy muscle contours – areas where it looks ok to have an abrupt change in color. I then exported the UV Map and used it as a reference (overlay) to digitally produce the texture in Photoshop. This process takes a good amount of tweaking because of the counterintuitive nature of drawing a 3D picture on a 2D surface. What’s Next) Next, I want to rig and animate the character, something that I have some experience doing (see my Emperor’s Champion post). I also want to finally give the guy some clothes! After that, I plan to make a female counterpart to this model and then sell both of them on a 3D model database like Turbosquid. This 3D animation was inspired by Warhammer 40K, one of my greatest childhood hobbies that I still do today. Warhammer 40K is a complex table-top game that requires each player to assemble and paint their own army. 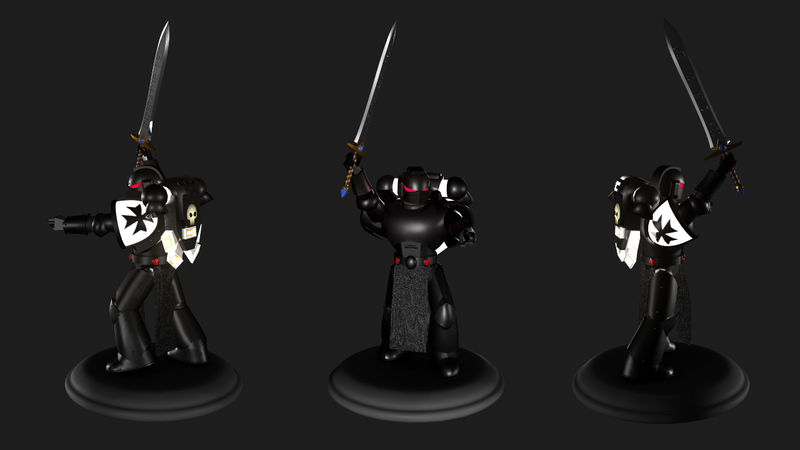 My primary army, which can be seen in the attached slideshow, is a Black Templars army led by the Emperor’s Champion (the character that is seen the 3D animation). I won’t go into too much detail about the fiction behind the game but I will say that the Warhammer 40K universe is expansive and the game is for people who love art as much as gaming. Every players army is entirely unique due to the fact that there are no pre-painted models. It is the only game that I have played that provides as much for my artistic cravings as it does for my desire to play. This animated short was created using Maya and Photoshop. It was the first animation that I ever did during my early explorations into the field of 3D and computer graphics at Columbia. This clip helped land me the job of teacher’s assistant for Jose Sanchez’s Engineering Graphics class for my last 4 semesters at Columbia.